Mad Hatter: Do you know "Twinkle Twinkle Little Star?" Alice: Twinkle twinkle little star, how I wonder what you are. Mad Hatter: No, no, no, no, no. That's not good at all. I prefer... Twinkle twinkle little bat, how I wonder what you're at. The Dormouse: [startled] Twinkle twinkle little skunk, how I wonder if you're drunk! The March Hare: Twinkle twinkle little ant... you do look strange without your pants. 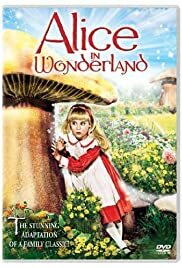 This is a great film-I watched the film as a child, and I actually played it for my kids tonight, they loved the songs, and I fell in love with the movie all over again! As I watched I thought about being a child and remembered all the actors that performed during the movie with a VERY small number of them STILL ALIVE. It is very hard for me to watch much TV, with reality shows, and not much family shows that I grew up on. I loved the cast, my husband even forgot about all the stars that filmed the movie, and was excited to see it. It would be great if today there could be an all-star cast for a TV movie just like this, but I doubt egos could coexist long enough for fans to have that chance. Great movie, great memories!